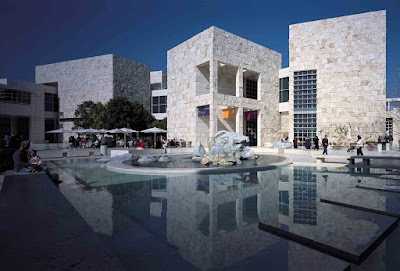 There are many reasons to visit the Getty Center here in Los Angeles: the architecture, the gardens, the views, and - of course - the artwork. I understand it is the richest private museum in the world. Aside from the parking fee, a visit to the Getty Center is free. My favorite work at the Getty is Velentin de Boulogne's "Christ and the Adulteress" (1620's). Light illuminates the neck and shoulders of a woman looking down at the figure of Christ kneeling on the ground. The Pharisees had brought to Christ a woman caught in the act of committing adultery. When they asked whether she should be stoned, he stooped down and began to write with his finger on the ground. When they continued to ask, Christ said, "He that is without sin among you, let him first cast a stone at her." The male accusers watch with varying expressions; some absorb Christ's words, while others recollect their own transgressions. 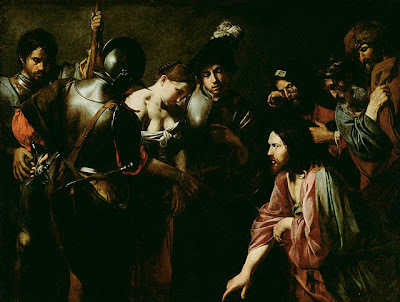 For this biblical narrative, Boulogne used contemporary, working-class people as models, a practice initiated by Caravaggio at the turn of the century. Who am I in this painting? One of the Pharisees, locked in my own self-righteousness? Or the woman, deserving condemnation yet receiving grace and forgiveness? Stopping, sitting down in the gallery, and reflecting on the content of this painting and it's historical narrative has literally moved me to tears as I think about my own life and Jesus' love and acceptance. "Jesus said, "Woman, where are they? Has no one condemned you?" "No one, sir," she said. "Then neither do I condemn you. Go now and leave your life of sin."